Though 1980s downtown New York produced some of the world’s most celebrated artists and aesthetes, a lone creative ingénue named Maripol was the scene’s standout style muse. A French expat photographer, stylist, designer, film producer (of Downtown ’81, naturally) and one-time art director for innovative uptown shop Fiorucci, Maripol created some of the most iconic jewelry of the time, crafting playful costume pieces from tactile synthetic materials that remain cannily relevant to this day. Her jelly bracelets, for instance, first appeared on Grace Jones’ ankles, then slid in heaps on Madonna’s wrists in her breakout “Lucky Star” promo pics. Lacking finances, Maripol shuttered her eponymous line and SoHo store in 1986, though her creations never left the collections of pop art stylistas or copycats. But, for the first time, Maripol is collaborating with Marc Jacobs to reissue 17 pieces from her original archives, including striking woven PVC necklaces and brightly colored, geometric bracelets. 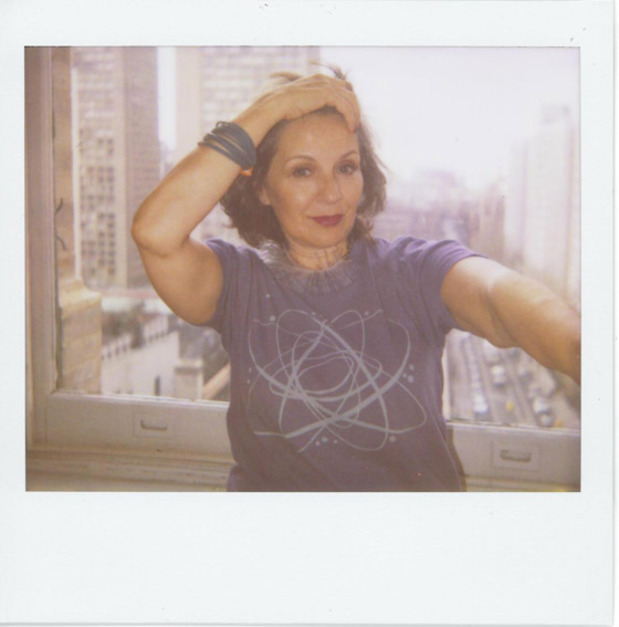 We met up with Maripol in a restaurant across from the SoHo loft where she’s lived for over 30 years. Read the complete, uncut interview after the jump. Well, you know, crazy punk days! I was wearing these earrings, and a scout from Fiorucci saw me and wanted to get 400 pairs right there. I said, okay, whatever. Then Elio Fiorucci himself gave me a ticket to go around the world when I was 23. “Go, we have an office in Hong Kong. Come back with a collection.” They never had jewelry before. Have you been to the Marc Jacobs store on West 11th and Bleecker? It’s kind of like walking into Fiorucci back in the days. I think that probably inspired Marc a lot when he went there as a kid. In what way is it like walking into Fiorucci? Because of the colors, the plastic, the plexi, the little items, the fun clothes. In Fiorucci, I started the concession concept, which means I invited designers to have their own boutiques, a bit like we would have done in England. There would be Screaming Mimis, Betsey Johnson was there, and it gave opportunities for downtown people to be uptown on 59th street. Why did you initially decide to use synthetic materials? My favorite street was Canal Street, so I got inspired by all the material—industrials. Then I would go to Japan, really far into the kabuki area where there were a lot of wholesalers. You’d have a place that had only raffia, another place with PVC, another place with aluminum. I’d buy all my material, do the line in the hotel room, then go to Hong Kong to manufacture. I’m inspired by the sea, like the spike necklace, which is inspired by a sea urchin. I grew up in Morocco, and when I was a kid and went to the market there I’d see people making stuff. I also scuba dived a lot in the Mediterranean over the years, and love everything about the flora of the ocean. You grew up in Morocco? My father was in the foreign military. We just happened to be there for eight years of my early life, and then France. But then when I was 20 I came here. I can’t believe it. I think it’s because I had a sense of coming from a pioneer family. When it’s in your blood, there’s nothing you can do. You just go on. Always go west. I think we all just landed here. How did your collaboration with Marc Jacobs come about? Does the city feel the same now as when you were first styling? Noooo, please! Especially when we first came to New York, this city was completely bankrupt. It really was broken. The rich people would shut themselves behind their doormen, and when you look at what Chanel and Gucci houses were at the time it was like, oop! Only the old ladies would shop there. The most interesting population for me was African Americans, because we lived uptown then and to see the way they dressed on Sunday was amazing. The Latinos, that was the beat of the city. And they were all on 42nd street, of course you still had the pimps and everybody there. But it was really a city that you could just basically do whatever you wanted to do. Do you think that energy lent itself to peoples’ personal style? Well we were in the disco days, that was a big influence. We brought in lamé jeans on Monday and by Wednesday we didn’t have anymore left. Even Calvin Klein said he got inspired to do jeans by Fiorucci—Fiorucci invented the designer jean concept. I think that’s what was great about New York, you had everything. You had people like Halston being a designer for the high society kind, and then you had Betsey Johnson, people doing their own style. It must be interesting to see the resurgence of the fashion you pioneered. The Napoleonic period was called L’Empire because Napoleon made war everywhere. If you look at the fashion, it’s all inspired by the Greek Renaissance. So I think it has something to do with always looking at something else. If one day somebody tells me they’re going to make contemporary clothes I’ll be happy, but what are contemporary clothes really? We all need to get dressed. Do you still talk to the people you used to style? I still talk to Debbie Harry. Madonna, I speak to rarely because she's always all over the planet somewhere. I saw her in Cannes and I miss her a lot, but it’s funny, I miss my old little Madonna. If I want to talk to her I can just email her. I really admire what she’s doing right now with Africa, she has the means to do it so it’s great. I always used to see a lot of spirituality in this girl and I wasn't too far from the truth. She just never stops. Did reissuing your old pieces make you nostalgic for that time? I try not to be nostalgic. But when you asked if I talked to those people now... so many people died. Like Andy Warhol and Jean-Michel Basquiat and Keith Haring, close friends of mine. They’re not here anymore. So that feels very empty. But when I was in LA I saw Exene from X and I saw the Screamers and I’m still very good friends with Kenny Scharf—but now he has children, and his children are friends with mine. It’s great to see the emerging generation. We know we’re leaving a legacy to the kids. My second book is coming out in October. It’s a mix of Polaroids, a lot of pictures of me as a stylist and about texture. Like a picture-diary-road-trip. I crossed America with the Screamers and I had my Polaroid. Those were the days when we were like Oh let’s have a party with a live PA in the loft. Oh, the fire dept came, somebody opened the water valve. You would be squatting in the loft with no heat. People think it’s glamorous to live in lofts now, but the minute you put your foot in and spend 25 years in one, they want to get you out. Are you working on anymore films? I was featured in a few documentaries this year. One was at the Tribeca Film Festival, it’s called Blank City by Celine Danhier, a French girl. It’s so sweet, because she saw an underground film about the new wave of the '80s and got inspired so she came here. I was also interviewed for another Basquiat documentary by Tamara Davis called The Radiant Child. And I have a film that I want to do about how to find love in the big city. I enjoy doing a little bit of everything.